William de Warenne, a close ally of William the Conqueror, came over with him in 1066, and was rewarded with substantial estates in the conquered realm. He was enough in his King’s confidence to be entrusted with one of the Sussex Rapes, which controlled the principal land routes between London and Normandy. We have previously heard about him as the founder of Lewes Priory, but he was also lord of the manor of Lewes and the builder of Lewes castle, owned by his descendants throughout the Middle Ages. Joanna is an Education Officer with the Sussex Archaeological Society, the present owners and custodians of the castle. As usual all will be welcome. This postcard, from ebay, appears to be relatively recent, probably after World War II, and illustrates the impact of the motor car on the Lewes townscape. The castle keep is visible in the background. According to google Kate Fowler Tutt was headmistress of the Lewes Central School, [reminiscences of Mabel Blaber who died aged 102 in 2008, 11 Dec 2008 Hastings & St Leonards Observer] or of the Central Girls School [1915 obituary of a pupil there aged 11]. The Boys & Girls Central Schools were, I think, the former National Schools on Southover Road, today a doctors’ surgery. Local directories for 1927 & 1938 show Miss K. Fowler-Tutt as resident at 28 St Swithuns Terrace (house name Llanberis), though by 1927 a Miss Flight was girls’ mistress at the Central School. According to her great-nephew Geoffrey Fowler Tutt [3 Jun 1999 Independent] Miss Fowler Tutt was the first female member of the Borough Council, and a stalwart there for many years, chairing various committees. The 1927 local directory confirms her as a member representing Castle ward, and a member of the Sanitary, Hospital for Infectious Diseases, Burial, Education and Fitzroy Free Public Library committees. In 1938 she was still representing Castle ward, still the Borough’s only female councillor, and was on the Education, Finance & General Purposes, Housing & Public Health, Library & Museum, Pleasure Grounds & Baths and Public Health committees. She now chaired the Hospital for Infectious Diseases committee. Page 129 from ‘The Chronicles of The Cliffe and South Malling’ by Brigid Chapman records what happened to Cliffe cemetery. It’s a shame that there’s no mention of what happened to the transcriptions of the gravestones, which themselves are clearly beyond any further protection. “August 1972: The disused graveyard on the east side of Malling Street was screened off from the road while it is cleared of the 150 graves it contained. It had to go to make way for the new layout of the county council’s inner relief road, the first phase of which was completed with the opening of Phoenix Causeway in 1969. St Thomas’ church never had a churchyard. It was surrounded by the Fair Place where, from 1421, chartered fairs were held twice a year and a market every Wednesday. The ‘ancient burying place’ of the parish was said by Horsfield to be ‘on the east side of North Street under the overhanging cliff’. It was enlarged twice in the 18th century and was extended in 1846 over the parish boundary into Malling. A transcript has been made of the inscriptions on the gravestones, which date from 1764 to 1866, and they have been piled into two arched entrances on the Cliffe Hill side of the site – perhaps the remains of the ‘two houses on the south side’ bought for £28 in 1796, and cemented over. This page of Brigid Chapman’s book is illustrated by a picture from Cliffe Hill of the work in progress, and another of the broken-up gravestones in their final resting place in the brick archways tunnelled into the hill. As the Cliffe, including its church, are built on an artificial causeway across the brooks, it would not have been possible to bury parishioners there. Barbara Merchant points out that the Sussex Family History Group has transcripts of 3,427 entries from the Cliffe burial registers and 102 memorial transcriptions. The former are probably taken from transcripts of the original parish registers held in the record office. There will of course have been many unrecorded burials prior to those included in the parish registers. Through the centuries when people were buried in a woollen shroud and their burial site marked, if at all, by a wooden cross, it was common practice to work round a graveyard every 2-3 generations. Development of coffin burials for even ordinary people slowed the natural processes down, so churchyard extensions were often needed from the 18th century onwards. Churchyard memorials rarely pre-date the 18th century, at least in this part of the country. The Cliffe was already a thriving community by the 13th century, so one would assume that the number of burial register entries will be only a fraction of the real number of burials from the parish, though not necessarily all in this small churchyard. 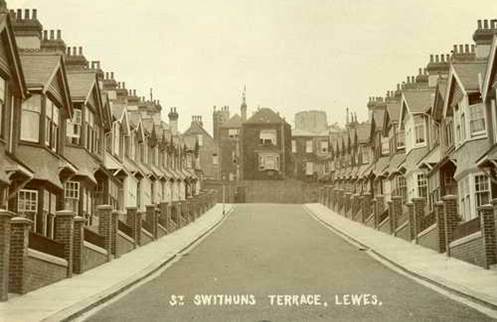 “The inhabitants of this parish had long continued to bury their dead at South Malling, and St John’s in Lewes; but for a considerable time back they have had a small cemetery in North-street”. Would that anyone was so interested in the state of this remarkable churchyard in the 21st century. The 1851 Post Office Directory lists the public facilities, gentry and tradesmen in each Sussex town and village. Its Lewes section names the following 27 inns and hotels. Many names on the list are still familiar today, and others will be recognised by those who have heard the talks by John Davey and Mathew Homewood. You did not have to buy your drinks from an inn. In addition to those named above, there were five wine & spirit merchants in Albion Street, High Street Cliffe (Harveys), School Hill, St Swithins Lane and Watergate Lane and 29 beer retailers in Commercial Square, Fisher Street, High Street (8), John Street (3), Lansdown Place, Little East Street, Malling Street (2), New Street, North Street, North Street Cliffe, South Parade, South Street Cliffe, Southover (5) and Sun Street (2). Some existing establishments are not included amongst this 1851 list – either they had not been established at this date, or they are hiding amongst the beershops. Each brewery owned its own chain of tied public houses, throughout the town and the surrounding district. Later Blue Books show that all four breweries continued in operation up to the Great War. This year’s Lewes Societies Fair is in the Town Hall on the morning of Saturday 13 July. Jane Lee, who is organising our stall, would appreciate additional help manning it between 11 am and 1 pm, and also setting up at 9 a.m. and taking it down at the end. Please contact Jane by email to Leweshistory@gmail.com or via twitter @leweshistory’. This entry was posted in Biographical Literature, Ecclesiastical History, Economic History, Education History, Family History, Lewes, Local History. Bookmark the permalink.